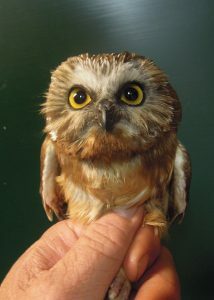 As we expected, this summer is proving to be a low year in Northern Saw-whet Owl reproduction. Last summer was the third time we experienced a peak in juvenile Saw-whet numbers since beginning the summer research in 2006. Both of the previous peak years were followed immediately by low years, so Ryan Steiner & I had our expectations set low in regard to the juvenile Saw-whets as we started this season. Although we admittedly wish the nights were a bit busier, the slow pace of the nights does allow us the time to really appreciate each owl and, relatively speaking, things have picked up a little the last few nights. 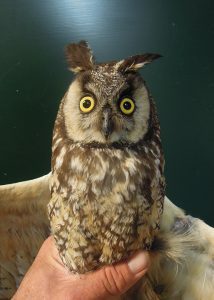 The first Long-eared Owl of the season arrived on July 17 and we have now banded seven so far this summer. All seven have been adults that have started replacing primary flight feathers. If you’ve been to the Point in late spring to watch the hawks, you’ve likely noticed that most buteos have begun replacing their primaries by late May. We never see owls in active flight feather molt at that time of the year, but regularly see adult Saw-whets and Long-eareds molting at this time of year, about two months later than when the buteos start. The Long-eareds have always started this molt with the innermost primaries, as is seen in the picture below. 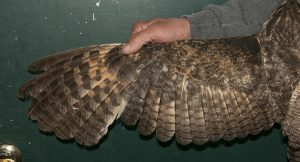 A Long-eared owl replacing its inner primary flight feathers. As is typical at this time of the season, the adult Saw-whet numbers have dropped off and the juveniles have picked up. We have only caught one adult since July 19, but have banded 25 juveniles since that date. We have now captured 84 Saw-whets, 37 adults and 37 adults. Of the 37 adults, 5 (14%) were previously banded. Most of the juveniles are still in the early stages of their molt into adult plumage, but the one pictured below had already replaced a lot of her facial disc feathers. A juvenile Northern Saw-whet Owl molting in its adult facial disc feathers.